My husband and I were thrilled when we became pregnant with our first child. We were due in March of 2016. There were some unexpected complications early on in the pregnancy, but I was monitored very closely by my OB (Dr. Scott) and my perinatologist (Dr. Lovgren). Fast forward to January 13th, 2016 and our world was changed. I would typically get kicked in the ribs by our baby (we didn't know the gender!) And on January 13th I was off work and noticed that I wasn't feeling as many kicks. After the encouragement of my husband I made an OB appointment to make sure everything was okay before going to my work baby shower that evening. Well...the fetal non stress test was concerning enough for Dr. Scott to admit me to the hospital. Thankfully Dr. Lovgren was the admitting doctor that day so I was able to see a familiar face as panic began to set in. I called my husband to start heading to the hospital from work, telling him that we may be having a baby tonight. At only 31 weeks and 4 days, this was NOT a phone call he was expecting to get. Dr. Lovgren performed a biophysical profile ultrasound which our baby failed. He was planning to repeat the ultrasound in 4 hours, but after calculating that our baby had dropped from the 18th percentile less than 2 weeks prior to below the 5th percentile, the decision was made to have an emergency c-section...now! The baby was not getting sufficient nutrients via my placenta and was in distress. My husband made it in time and I was in tears. One nurse was helping me sign consents while another was giving me a steroid shot for the baby's lungs. Another was putting compression stockings on while another was hooking up my IV fluids. My husband was attempting to get dressed in his OR scrubs as we were rushing down the hall to the OR. Dr. Lovgren told us if I would have waited a couple more hours before coming in, that the delivery room outcome would have been drastically different. Chills still run down my spine when I think about it. Within only a few minutes of "go time" our 2lb 8oz baby girl was born. One nurse was helping me sign consents while another was giving me a steroid shot for the baby's lungs. Another was putting compression stockings on while another was hooking up my IV fluids. My husband was attempting to get dressed in his OR scrubs as we were rushing down the hall to the OR. 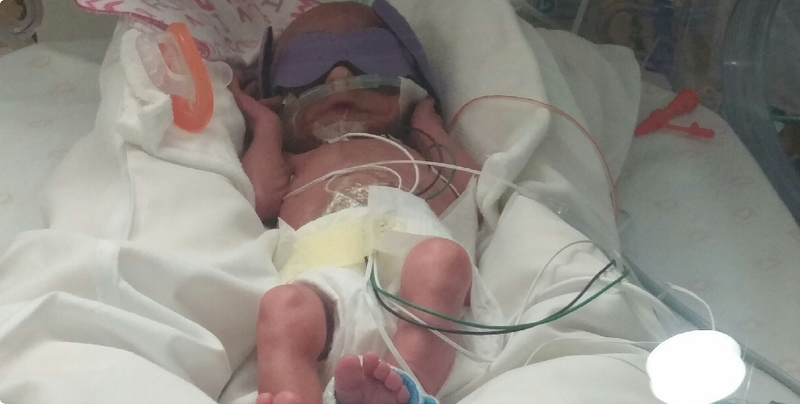 She was quickly placed in the hands of the NICU team and for the next 8 weeks that was her home. My husband was running back and forth between the two of us and told me she was perfect! The next 8 weeks were quite a rollercoaster ride. It was painful to leave her at night and I couldn't get up to the hospital fast enough the next morning. Every single person (aka angel) that we encountered at Methodist was AMAZING! Words can't explain how grateful we are. Our daughter Chloe spent 54 days in the NICU and was discharged the week of her due date. 3 months after discharge we visited our NICU family. It was a surreal experience walking back into the hospital (this time WITH our daughter). We were able to see several of our phenomenal caregivers! We hope to see even more at the NICU reunion. Now Chloe is almost 5 months old and doing great. She just broke 9lbs! She has several heart defects that may need surgery down the line, but for the time being we are trying not to worry about what hasn't happened yet. Although this was my first pregnancy and first child, I'm sooooooo thankful I went in to get checked out. The "mother's gut feel" is not something to ignore. No one expects to have a NICU baby, but if you do, know that you are in AMAZING hands at Methodist. They truly will become family. We love you all. Thank you for saving our baby.